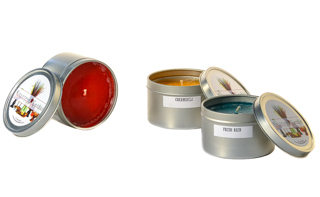 Our candle tins are great to use in small rooms like the bathroom or office. 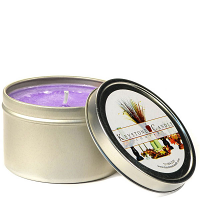 We hand pour these scented candle tins and load them with fragrance so they smell great. If you need personalized candle tins for wedding favors, bridal shower favors, or even baby shower favors, we can do that for your too. These travel candle tins are nice for when your on the go too. Most hotels and motels will not allow you to light a candle in your room but you can still freshen the air just by taking off the lid and placing it by your bed. 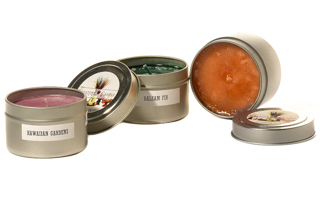 We recommend that if you are packing these small candles you put the candle tins in a zip lock bag to keep any seeping wax off your clothes. We offer these candles in a tin in two different sizes. Love, love, LOVE these candles. I love this scent and the votives last a very long time and make my house smell so good!